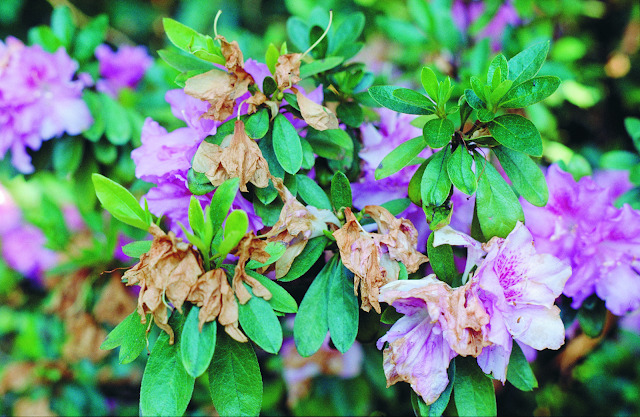 Azalea Petal Blight is caused by fungus and is a problem common in warm humid areas like the Coffs Coast. It ruins azalea spring flower displays. The petals develop spots, brown on white flowers and cream on coloured flowers. Soon the petals turn completely brown, collapse and die with the flowers remaining on the stems harbouring the fungus. If you wish to have a good display of spring flowers on your azaleas it's time to do a little work now. As with many fungi it is difficult to deal with and no sure way to completely eradicate it however it is best treated with cultural and preventative steps to help control it. 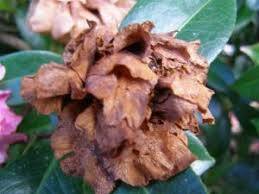 It is very important to remove and destroy all the infected flowers as the fungal spores remain with the collapsed flowers until the following year when favourable conditions will enable it to flourish once again, thus continuing the cycle. There are some steps to take which will help - one of these is NOT to water azaleas overhead. As their roots are shallow it is best to do deep watering on the ground during dry times. There is also a preventative fungicide called Zaleton that will help control the fungus. Spraying has to commence as soon as the buds emerge and continue to do so every two weeks until the flowers have finished. You will be astounded just how good your bushes will look if you are diligent in this spraying program. With all chemicals care has to be taken in their use and this chemical is no exception, it does have toxic side effects, so please read the safety information and wear protective gear when applying.